Day 84. I’ve moved offices—from the guest bedroom to a fancy editing bay that has been set up in the middle “library” room in our house. It’s state of the art and ready to go. 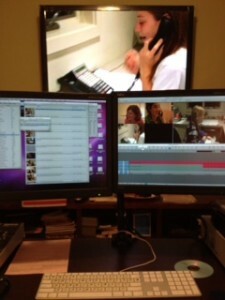 It includes a plasma TV wired directly to the Avid and a cool desk that moves up and down with the push of a button so I can sit or stand while I edit. It’s pretty damn awesome but it doesn’t change, or make easier, the amount of work that still needs to be done. Since the tragic news from Dan the Amazing Editor Man about his mother, I am an island—floating out in the vast documentary editing sea all alone. My partner is traveling for his show for the next five weeks and I have no idea when Dan will resurface. We’re certainly not going to push him. So, it’s just me, the self-proclaimed non-editor and 30 scenes left to assemble and string out from hundreds of hours of footage. Despite my spiffy new digs, depression has set in. Not only am I “bloody Ibiza” to quote Hugh Grant’s character in About a Boy but I’m also staring down doing all this work sans gluten free sugar free cookies or popcorn or, well, anything else for that matter. I can’t eat. I can only drink liquids for the next week and then I graduate to liquids and soft foods for the next—wait for it—two to three months. Basically, I won’t be chewing again until like July! How am I supposed to get anything done without my brownies and chicken wings to keep me going? Hmmm, this is going to be an interesting 12 weeks. 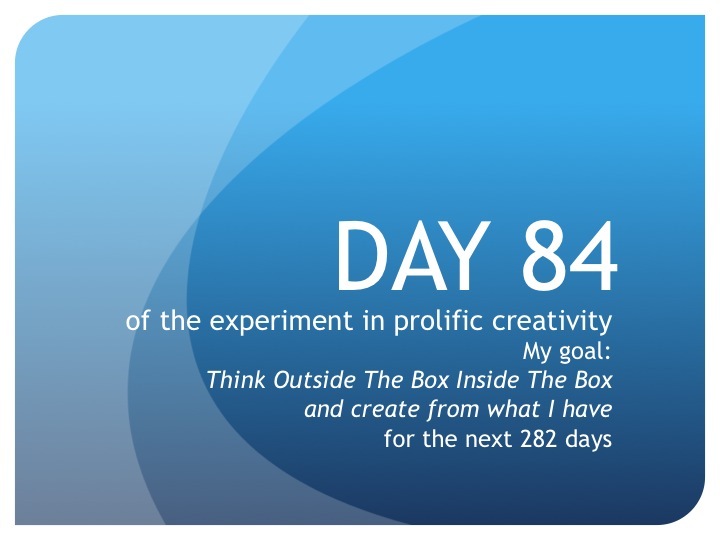 I’m really going to have to do some serious thinking outside the box inside the box. I wonder if I can purée chicken wings into a soup and then drizzle it with ranch dressing? I’ll keep you posted. Until tomorrow, create from what you have…and get back on the trail that leads you to where you want to go.